You can access Red Hat Gluster Storage volumes using the Server Message Block (SMB) protocol by exporting directories in Red Hat Gluster Storage volumes as SMB shares on the server. This section describes how to enable SMB shares, how to mount SMB shares manually and automatically on Microsoft Windows and macOS based clients, and how to verify that the share has been mounted successfully. Follow the process outlined in Overview of configuring SMB shares. The details of this overview are provided in the rest of this section. Verify that your system fulfils the requirements outlined in Section 6.3.1, “Requirements for using SMB with Red Hat Gluster Storage”. If you want to share volumes that use replication, set up CTDB: Section 6.3.2, “Setting up CTDB for Samba”. Configure your volumes to be shared using SMB: Section 6.3.3, “Sharing Volumes over SMB”. If you want to mount volumes on macOS clients: Section 6.3.4.1, “Configuring the Apple Create Context for macOS users”. Set up permissions for user access: Section 6.3.4.2, “Configuring read/write access for a non-privileged user”. Samba is required to provide support and interoperability for the SMB protocol on Red Hat Gluster Storage. Additionally, CTDB is required when you want to share replicated volumes using SMB. See Subscribing to the Red Hat Gluster Storage server channels in the Red Hat Gluster Storage 3.4 Installation Guide for information on subscribing to the correct channels for SMB support. Enable the Samba firewall service in the active zones for runtime and permanent mode. The following commands are for systems based on Red Hat Enterprise Linux 7. If you want to share volumes that use replication using SMB, you need to configure CTDB (Cluster Trivial Database) to provide high availability and lock synchronization. CTDB provides high availability by adding virtual IP addresses (VIPs) and a heartbeat service. When a node in the trusted storage pool fails, CTDB enables a different node to take over the virtual IP addresses that the failed node was hosting. This ensures the IP addresses for the services provided are always available. In a CTDB based high availability environment of Samba , the locks will not be migrated on failover. Enable the CTDB firewall service in the active zones for runtime and permanent mode. The following commands are for systems based on Red Hat Enterprise Linux 7. Create a new replicated volume to house the CTDB lock file. The lock file has a size of zero bytes, so use small bricks. In the following files, replace all in the statement META="all" with the newly created volume name, for example, META="ctdb". The S29CTDBsetup.sh script runs on all Red Hat Gluster Storage servers, adds an entry in /etc/fstab for the mount, and mounts the volume at /gluster/lock on all the nodes with Samba server. It also enables automatic start of CTDB service on reboot. Verify that the /etc/sysconfig/ctdb file exists on all nodes that are used as a Samba server. This file contains CTDB configuration details recommended for Red Hat Gluster Storage. Create the /etc/ctdb/nodes file on all the nodes that are used as Samba servers and add the IP addresses of these nodes to the file. The IP addresses listed here are the private IP addresses of Samba servers. Start the CTDB service on all the nodes. After you follow this process, any gluster volumes configured on servers that run Samba are exported automatically on volume start. The procedure to share volumes over samba differs depending on the Samba version you would choose. You can also enable generic metadata caching to improve performance. See Section 21.7, “Directory Operations” for details. Restart the glusterd service on each Red Hat Gluster Storage node. To export gluster volume as SMB share via Samba, one of the following volume options, user.cifs or user.smb is required. Red Hat Gluster Storage 3.4 introduces a group command samba for configuring the necessary volume options for Samba-CTDB setup. Configure this share so that a client can mount it using the address of any server in the trusted storage pool that provides this volume. Path Yes n/a It represents the path that is relative to the root of the gluster volume that is being shared. Hence / represents the root of the gluster volume. Exporting a subdirectory of a volume is supported and /subdir in path exports only that subdirectory of the volume. glusterfs:volume Yes n/a The volume name that is shared. glusterfs:logfile No NULL Path to the log file that will be used by the gluster modules that are loaded by the vfs plugin. Standard Samba variable substitutions as mentioned in smb.conf are supported. glusterfs:loglevel No 7 This option is equivalent to the client-log-level option of gluster. 7 is the default value and corresponds to the INFO level. Run service smb [re]start to start or restart the smb service. Run smbpasswd to set the SMB password. Specify the SMB password. This password is used during the SMB mount. Add the following lines to the [global] section of the smb.conf file. Note that the indentation level shown is required. Load the vfs_fruit module and its dependencies by adding the following line to your volume's export configuration block in the smb.conf file. From any other Samba server, mount the volume using the FUSE protocol. Use the setfacl command to provide the required permissions for directory access to the user. Install the cifs-utils package on the client. Run mount -t cifs to mount the exported SMB share, using the syntax example as guidance. The sec=ntlmssp parameter is also required when mounting a volume on Red Hat Enterprise Linux 6. In Windows Explorer, click Tools → Map Network Drive…. to open the Map Network Drive screen. Choose the drive letter using the Drive drop-down list. In the Folder text box, specify the path of the server and the shared resource in the following format: \\SERVER_NAME\VOLNAME. Click Finish to complete the process, and display the network drive in Windows Explorer. Navigate to the network drive to verify it has mounted correctly. Click Start → Run, and then type cmd. Enter net use z: \\SERVER_NAME\VOLNAME, where z: is the drive letter to assign to the shared volume. Ensure that your Samba configuration allows the use the SMB Apple Create Context. Ensure that the username you're using is on the list of allowed users for the volume. In the Finder, click Go > Connect to Server. In the Server Address field, type the IP address or hostname of a Red Hat Gluster Storage server that hosts the volume you want to mount. When prompted, select Registered User to connect to the volume using a valid username and password. If required, enter your user name and password, then select the server volumes or shared folders that you want to mount. To make it easier to connect to the computer in the future, select Remember this password in my keychain to add your user name and password for the computer to your keychain. For further information about mounting volumes on macOS, see the Apple Support documentation: https://support.apple.com/kb/PH25269?locale=en_US. In the OPTIONS column, ensure that you specify the credentials option, with a value of the path to the file that contains the username and/or password. See the mount.cifs man page for more information about these options. Click the Reconnect at logon check box. If the Windows Security screen pops up, enter the username and password and click OK.
Manually mount the volume using the process outlined in Section 6.3.5.3, “Manually mounting volumes exported with SMB on macOS”. In the Finder, click System Preferences > Users & Groups > Username > Login Items. Drag and drop the mounted volume into the login items list. Check Hide if you want to prevent the drive's window from opening every time you boot or log in. Verify the virtual IP (VIP) addresses of a shut down server are carried over to another server in the replicated volume. Mount a Red Hat Gluster Storage volume using any one of the VIPs. Run # ctdb ip to locate the physical server serving the VIP. Shut down the CTDB VIP server to verify successful configuration. When the Red Hat Gluster Storage server serving the VIP is shut down there will be a pause for a few seconds, then I/O will resume. Rename the S30samba-start.sh to K30samba-start.sh. For more information about these scripts, see Section 13.2, “Prepackaged Scripts”. A snapshot is a read-only point-in-time copy of the volume. Windows has an inbuilt mechanism to browse snapshots via Volume Shadow-copy Service (also known as VSS). Using this feature users can access the previous versions of any file or folder with minimal steps. Shadow Copy (also known as Volume Shadow-copy Service, or VSS) is a technology included in Microsoft Windows that allows taking snapshots of computer files or volumes, apart from viewing snapshots. Currently we only support viewing of snapshots. Creation of snapshots with this interface is NOT supported. To configure shadow copy, the following configurations must be modified/edited in the smb.conf file. The smb.conf file is located at etc/samba/smb.conf. Ensure, shadow_copy2 module is enabled in smb.conf. To enable add the following parameter to the vfs objects option. shadow:snapdir Yes n/a Path to the directory where snapshots are kept. The snapdir name should be .snaps. shadow:basedir Yes n/a Path to the base directory that snapshots are from. The basedir value should be /. shadow:sort Optional unsorted The supported values are asc/desc. By this parameter one can specify that the shadow copy directories should be sorted before they are sent to the client. This can be beneficial as unix filesystems are usually not listed alphabetically sorted. If enabled, it is specified in descending order. shadow:localtime Optional UTC This is an optional parameter that indicates whether the snapshot names are in UTC/GMT or in local time. shadow:format Yes n/a This parameter specifies the format specification for the naming of snapshots. The format must be compatible with the conversion specifications recognized by str[fp]time. The default value is _GMT-%Y.%m.%d-%H.%M.%S. shadow:fixinodes Optional No If you enable shadow:fixinodes then this module will modify the apparent inode number of files in the snapshot directories using a hash of the files path. This is needed for snapshot systems where the snapshots have the same device:inode number as the original files (such as happens with GPFS snapshots). If you don't set this option then the 'restore' button in the shadow copy UI will fail with a sharing violation. shadow:delimiter Optional _GMT delimiter is used to separate shadow:snapprefix and shadow:format. In the above example, the mentioned parameters have to be added in the smb.conf file to enable shadow copy. The options mentioned are not mandatory. Shadow copy will filter all the snapshots based on the smb.conf entries. It will only show those snapshots which matches the criteria. In the example mentioned earlier, the snapshot name should start with an 'S' and end with 'p' and any alpha numeric characters in between is considered for the search. For example in the list of the following snapshots, the first two snapshots will be shown by Windows and the last one will be ignored. Hence, these options will help us filter out what snapshots to show and what not to. Right Click on the file or directory for which the previous version is required. Click on Restore previous versions. 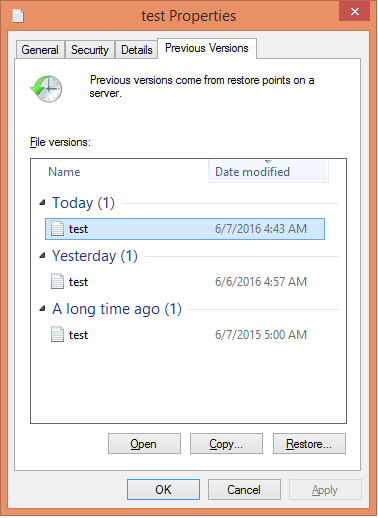 In the dialog box, select the Date/Time of the previous version of the file, and select either Open, Restore, or Copy. Open: Lets you open the required version of the file in read-only mode. Restore: Restores the file back to the selected version. Copy: Lets you copy the file to a different location. Enabling Metadata Caching to improve the performance of SMB access of Red Hat Gluster Storage volumes. More detailed information for each of this is provided in the sections ahead. Enable metadata caching to improve the performance of directory operations. Execute the following commands from any one of the nodes on the trusted storage pool in the order mentioned below. If majority of the workload is modifying the same set of files and directories simultaneously from multiple clients, then enabling metadata caching might not provide the desired performance improvement. This is group set option which sets multiple volume options in a single command. n, is set to 50000. It can be increased if the number of active files in the volume is very high. Increasing this number increases the memory footprint of the brick processes. The directory listing gets slower as the number of bricks/nodes increases in a volume, though the file/directory numbers remain unchanged. By enabling the parallel readdir volume option, the performance of directory listing is made independent of the number of nodes/bricks in the volume. Thus, the increase in the scale of the volume does not reduce the directory listing performance. You can expect an increase in performance only if the distribute count of the volume is 2 or greater and the size of the directory is small (< 3000 entries). The larger the volume (distribute count) greater is the performance benefit. Before creating / renaming any file, lookups (5-6 in SMB) are sent to verify if the file already exists. By serving these lookup from the cache when possible, increases the create / rename performance by multiple folds in SMB access. The above command also enables cache-invalidation and increases the timeout to 10 minutes.